The Government Pharmaceutical Organization (GPO) — which is overseeing Thailand’s legalization of medical marijuana — has announced their plans to start planting this February in order to extract cannabis oil to be used by May or June. Thailand has endured many military coups since ending its absolute monarchy in 1932. NAKHON PHANOM — Police in the northeast denied that a third corpse had been recovered from the Mekong River after two others were linked to anti-monarchy dissidents missing in Laos. Global Power Synergy Plc (GPSC) will acquire the Energy Recovery Unit (ERU) project from Thai Oil Plc (TOP) for US$757 million (24.1 billion baht). Thailand’s National Broadcasting and Telecommunications Commission has approved plans to shut down 2G services on October 31 to allow operators to better focus their resources on 5G. Thais get their opportunity to express their democratic vote and will go to the polls on Sunday, March 24. The Election Commission (EC) has announced the date after chairing an urgent meeting of EC members this afternoon. NAN: Residents at a village in Pua district are demanding the Community Development Department take back all items supplied to promote a tourism project for local communities. Indochinese tigers once roamed far and wide across much of Southeast Asia, but the striped predators have already been driven extinct in Vietnam and Cambodia. “The world is on the brink of facing mega cyberattacks and enterprises need to be prepared more than ever before.”With these words Gil Shwed, founder and CEO of Israeli software technology company Check Point, kicked off CPX360, a leading cybersecurity summit and the biggest event of its kind in Asia Pacific (APAC).Held at the Centara Grand Convention Centre in Bangkok, Thailand, on 21-24 January, the summit has attracted more than 1,000 cybersecurity professionals and C-level executives from all over the APAC region. The Director General of the Department of Social Development and Welfare has continued to develop a database for requesting a social enterprise certificate online (SE Online). The Thai army said on Wednesday it had no knowledge of two exiled critics of the military and royal family whose bodies police say were found stuffed with concrete along the Mekong River border with Laos. LOP BURI: Students and teachers fled choking from their smoke-filled classrooms as farmers defied a ban on burning-off their nearby cane fields to prepare the crop for harvest. The annual B.Grimm-BMW sponsored Thai Polo Open takes place on Saturday, January 19 at the Thai Polo & Equestrian Club in East Pattaya. One of the most prestigious events on Thai Polo and socialite calendar, the tournament is being organized to raise funds for H.R.H. Princess Maha Chakri Sirindhorn’s Chitralada Vocational School project. A model from Belarus who claimed to have evidence of Russian interference in U.S. President Donald Trump’s election was freed from Russian police custody on Tuesday, but remains a suspect in an unrelated criminal case, the TASS news agency reported. Chalong Police today confirmed they were tracking down the tourist caught walking along Chalong Pier yesterday (Jan 22) with a starfish in a plastic bag. A delegation of Chinese Embassy officials and diplomats from Bangkok visited Pattaya yesterday to seek more information and request upgrades in safety for Chinese citizens when visiting the resort city. Pattaya firefighters and marine rescuers brushed up on their emergency-response skills at a five-day training course. THE OFFICE of Higher Education Commission (Ohec) will consider a new Thai Qualifications Framework (TQF) for teacher-education programmes next month. BANGKOK, Chiang Mai, Pattaya and Phuket looks set to remain top destinations for Chinese property buyers in 2019 with a growth of at least 10 percent, according to an international property portal. 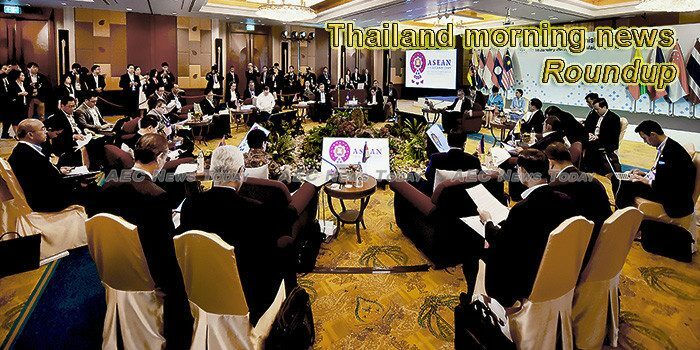 Thailand, led by the National Legislative Assembly (NLA), is slated to play host to a meeting of the Asian Parliamentary Assembly (APA) Standing Committee on Social and Cultural Affairs in mid-February. The changing lifestyles and preferences of consumers are causing financial distress to many retailers who refuse to reinvent their stores. Traditional retailers are under intense pressure from the rapid transformation of the retail industry. Thai Deputy Prime Minister and Minister of Defence Prawit Wongsuwan is currently visiting Vietnam from January 23-24, with the intention of enhancing the traditional friendship and mutual understanding between the two nations’ armies. Residents at a village in Pua district are demanding the Community Development Department take back all items supplied to promote a tourism project for local communities. Four workers were killed and others injured when part of a crane boom broke off and fell to the ground at a condominium construction site on Rama III in Bangkok on Wednesday afternoon. This week’s Thailand morning news feature photo acknowledges the 2019 Asean Foreign Minister’ Retreat, Chiang Mai, Thailand January 17-18.